Went to EMMA do @ CAS today and heard Lee Thomas’ newest install. Two Thesis (see what I did there?) to run two Morel Ultimos and Morel Elate Ltd eds three ways on active Audiowaves and a fabby build. Bloody awesome – in your face delicious. Fast and wonderfully dynamic with incredible detail retrieval and rise time like the punch of that shrimp that hits things. Played a bit of Gracelend and I heard stuff I had no idea was on the disc. Only been out forever and been used in reviews before. Lovely bloke with mad bonkers grade golden ears. Check him out if you can guys, he is a scary guy. Dare I say it, better than the Turners cars. Well after 5 weeks of 12 hour days David’s Sonic Bliss with custom door builds. Pillar builds, Stealth boot install and a upfront subwoofer is done in time for the Volksfest! 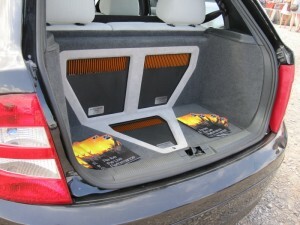 As with all the Sonic Systems from Sonic Bliss and above each system is carefully tailored to each vehicle, customers height, seating position and the system is then fully run-in even before the customer picks the car up. Like all Sonic Systems each system is carefully tried and tested through many dedicated listening sessions each installation are done to customers exact requirements and beyond their expectations. I today met David and Shane, both very nice guys with some fantastic sounding installs. I will start first with david’s system as its his tread. Sonic Bliss! It sure as heck was! Now 10k is a lot of money but imo its worth every single penny. Rarely if ever have I sat in a car that I enjoyed as much as paul’s. I won’t spout technical rubbish like holographic imaginary and a representational spatial sound field .. no this car flipping rocks. All I can say is, its worth every penny, no matter what the volume, no matter what the music it is truely awesome. I’ve just spent 3 hours driving home listening to CD’s I ‘thought’ I knew hearing parts I had never noticed, I can hear indiviual instruments being layered with varying dynamics to devope the full bodied sound, it really scares me and brings out the goosebumps, as I said to Lee this is going to cost me a fortune in CD’s, however the old ones are now being brought back out to enjoy. All in all I am very happy and loving the music!! !